The World Cup of soccer is back! The Nilsen Report will be your #1 place to tune into all the games throughout the tournament. Tune in tomorrow for our LIVE STREAM debut of Russia and Saudi Arabia! LIVE STREAM AT BOTTOM OF PAGE! 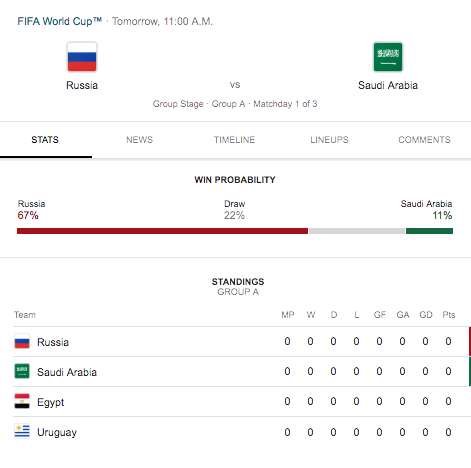 Russia and Saudi Arabia kick off the 2018 World Cup on Thursday with their Group A match at Luzhniki Stadium in Moscow (11 a.m. ET). World Cup host Russia is a -230 sportsbook money-line favorite (bet $230 to win $100), with the over-under for total goals scored set at two. Before you make a wager on the world’s most-watched sporting event, you need to see which country football expert Thomas Rongen has chosen. The Dutch-American commentator boasts an incomparable background. He’s the former assistant coach and chief international scout for the U.S. men’s national teams and was the former head coach of the U.S. men’s Under-20 team. He also was named MLS coach of the year in 1996 for the Tampa Bay Mutiny. Rongen has broken down every World Cup roster and locked in his pick at SportsLine for Russia vs. Saudi Arabia. Rongen has identified the X-factor that will determine the outcome based on his inside knowledge of these players and coaches. The match will start following an opening extravaganza at the host stadium that is expected to include approximately 500 performers, including gymnasts and dancers. International pop star Robbie Williams will perform alongside rising Russian artist Aida Garifullina. Then, the focus will turn to the pitch. Rongen knows both clubs have faced adversity in preparations for the 2018 World Cup, but they have their sights set on a hope-inspiring victory. Russia, which bypassed the qualification process as tournament host, is the lowest-ranked of the 32 teams, having failed to advance past the group stage of any tournament since 2008. There are off-the-field problems too, with reports of disputes between players and the coach. Russia has endured five-match winless streak since beating South Korea in October 2017 to drop to No. 66 in the FIFA rankings. Rongen also knows Saudi Arabia has fired two coaches since qualifying for the FIFA World Cup 2018. Juan Antonio Pizzi was recently named to lead the team, whose second-round exit in 1994 is its best finish. Pizzi takes over after failing to get Chile to the World Cup through the qualifying stage. LIVE STREAM BELOW! CLICK BELOW!